Fake McQueen toy car package. Nothing beats a Bud? OK, give me a can of nothing. Once you go Engrish you can’t go back. The slippery slope of addiction. Once always more. Once blown, nothing can in bed. That’s what my wife said right after we were married. Can or can not. There is no instead. – To can or not to can? – What, are you insteading me? I was own. Now I can instead. 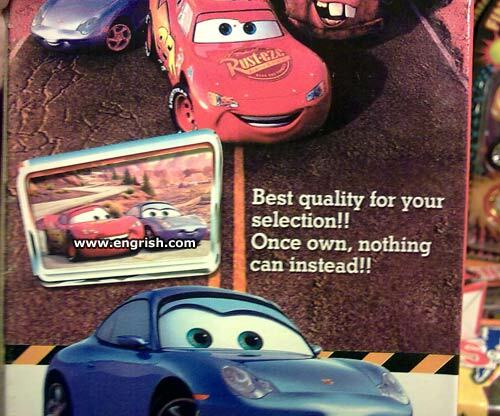 I’d question the ‘best quality’… you’re more likely to be owned and get nothing instead! Ok, but once tired of it, anything can instead. It better! I hate when can insteading me.